Our featured job of the week is for a large healthcare organisation located in the East of England, who are looking to appoint an experienced Director of Estates and Facilities who is operationally astute, and is also able to understand the need to review and improve delivery models within this functionality. Our featured job of the week is for our client, a large NHS organisation located in the South East, who are currently seeking a very capable individual to oversee the Estates and Facilities Directorate whilst they recruit to the permanent post. Our featured job of the week is for our client, an NHS Trust in London, who are looking to appoint an individual with exceptional commercial and strategic skills to lead their infrastructure, estate, environmental and commercial development activities across their entire property portfolio. 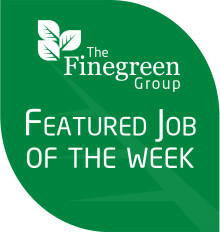 Our featured job of the week is for is an NHS Foundation Trust located in London, who are seeking to appoint an Estates and Capital Projects Manager to lead the Estates operational and maintenance services for the Trust ensuring that the buildings, engineering systems and grounds are safe, within budget and improve the patient’s experience. Finegreen nominated for the Product Innovation in Healthcare Award at next month's Healthcare Estates Awards! We are delighted to announce we have been shortlisted for the Product Innovation in Healthcare Award at next month's Healthcare Estates Awards, taking place on October 7th at the Mercure Hotel in Manchester.